Steve Rice (Olympia, United States) on 27 October 2010 in Landscape & Rural and Portfolio. The four mile (6.4 kilometer) trail from Barlow Pass to Monte Cristo follows the roadbed of the Everett & Monte Cristo Railway. The trail is heavily wooded in places and open in others affording views of the 7,000 foot (2,134 meter) peaks in the area. Wow - fantastic exposure and I love the framing to give a sense of height to the trees. A majestic place! Who! Dark and bright! In the mystery of ferns and clarity of the foliage! just beautiful! Oooo that's beautiful! Love the glow of the backlight and the colors! manque plus que les farfadets ! and the background has a painted feeling with great detail also. A magical capture. A splendid shot. Excellent composition and point of view Steve! wow ! I love it, Steve ! superb colors and a magical fairy tale atmosphere ! Love the light in this shot.. amazing. Wonderful frame . Light through trees is fabulous ! jA fantastic image. Thanks for sharing. Wow, impressive trees and great focal point! Great shot! I like the special look of this shot of high contrasts in light. It is very effective to have us looking from the deep woods at the bright light beyond. Excellent. Beautiful composition! Superb colors and light! The magic forest! I love it! You have caught the majestic size and wonder and mystery of the forest. Your lighting is exquisite and sets the mood !! 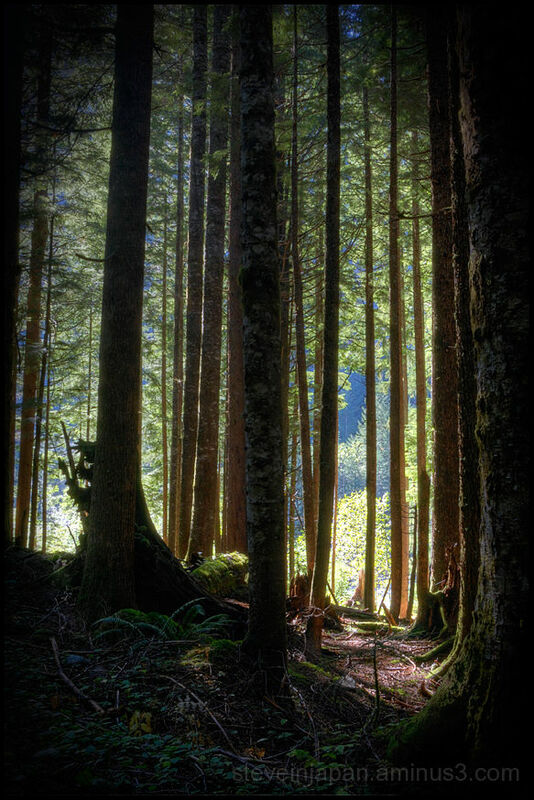 A beautiful forest shot, and the light coming through the trees is quite lovely. NB: Many thanks Steve for all your 'catch-up' comments. I love forests and this twilight seen by the inside is very well made! Lovely ! It could be an illustration for a fairy tale ! Oh myyy.. like the land before time. The trees are like a portal into another world, fantastic shot!!! Beautiful light and height that you've captured in this composition. oh my! This is brilliant!! WOW! The light is simply ... w o w !! This is one outstanding shot, Steve. I like everything about it. wow, this is a gorgeous picture, really! I love your forest images, Steve. They are so beautiful, and real. Reminds me the one i grew up by. I'll go back soon & browsed through my own forest images lately, a post soon. What i love in yours here is the clarity beyond the thin and so elegant trunks. So inviting, one feels like walking here like entering a dream. I enjoy your perfect light utterly. Great work with light here... Well captured two different moods. How did you get this effect? What a magical photograph! @bluechameleon: It's a five frame HDR that I tweaked until I liked the result. Super light through the trees! Fantastic work... the light is magic... a good picture for a fairytale. The vignette works so great! THis is just magical!